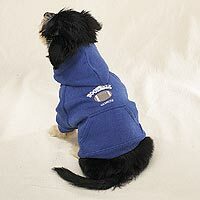 Sports-lovers will love these fun fashions for their active dogs. Cozy and soft sweatshirt is silk screened with a popular sports logo and features a muff-style pocket on the back. Ribbed cuffs and waistband provide an easy and comfortable fit. Polyester knit fabric is machine washable for easy care. Hooded Sweatshirts are available in Sage Basketball, Red Hockey, Blue Football, and Gray Soccer. Colors correspond to sport type.